It is no surprise that library signage tends to be inclusive: Book displays, event fliers, posters, and other artwork communicate that all are welcome. Rebecca McCorkindale, assistant library director/creative director at Gretna Public Library in Nebraska (along with Julie Syler and Ashley Jones from Saline County Library in Arkansas) created Libraries Are for Everyone, an image that anyone can download and use for free (hafuboti.com/2017/02/02/libraries-are-for-everyone). It has variations depicting people of different abilities, skin tones, sexualities, religions, nationalities, and more. It’s even been translated into 80-plus languages. I spoke to McCorkindale over email, and our conversation has been condensed and edited. This seems like an easy question, but I’ve written and rewritten my response many times. To try and get to the core of my many long-winded responses: I paid attention, I cared (still do), and it’s a necessity in our field. 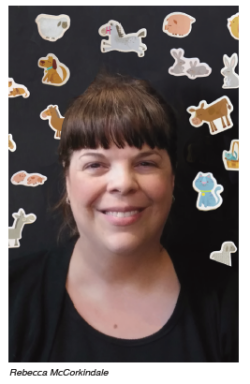 When I began my library career more than 8 years ago, I never thought that I’d be a library advocate: I didn’t have an elevator pitch, and I didn’t want one. But over the years, as I’ve watched libraries struggle to stay open or get the funding they deserve, I had to push through my comfort zone and speak out in any way that I could. Do I have an elevator pitch now? The answer is still no. That’s not something that I’m comfortable with, but I’ve found other things that I actually enjoy doing—and I do those instead. And those things aren’t really a secret: I brag about my library team. I don’t like bragging about what I do, but you want me to tell you about my library? I’ll tell you about wonderful things our librarians do with their limited resources. I’ll also invite people to library events to see firsthand how awesome a public library is that is in touch and responsive to its community. Where does the inspiration for your artwork come from, and how do you harness it? My art, like my advocacy, has massively evolved over time. I can say with 100% certainty that I would not be creating and putting out my artwork if it weren’t for my husband. He saw a potential in me that I didn’t know was even there, and then he gave me the tool of Photoshop, and he showed me how to use it. That was a major turning point when I realized that I could turn my ideas into concrete works of art. The majority of my inspiration comes from me having a goofy random idea, such as “Mouse on a Gruffalo” (hafuboti.com/2018/10/27/mouse-on-a-gruffalo) or “Oh My Beverly Cleary!” (hafuboti.com/2015/05/10/oh-my-beverly-cleary). But the artwork that has made me famous-ish in the library world came from frustration. And here’s the thing: Over time, one of my mottoes has become, “Is there a problem? Then get creative and fix it. Library workers are problem-solvers extraordinaire!” (I never said that it was a short motto.) So when I saw artwork showing some variations in skin tone in a national library program, but the only obvious person with a disability is in an old-school wheelchair, I thought, The disability community is so much more diverse and deserves to be represented more often outside of wheelchairs. Usually, I’d ask my husband to step in, since he’s a professional artist, but this time around I knew it was too big of a request. I quickly realized that I could do a lot with the library logo (which I’d only had fun with up until this point; see hafuboti.com/2014/01/20/readers-assemble, for example), but I needed to figure out what disabilities I could show in that minimalist style. So I hopped on Facebook and asked my friends for help, and they came up with so many of the disabilities that I used. And it wasn’t until Julie Syler, a librarian whom I had never met before, reached out to me with the basic Libraries Are for Everyone design that I realized how deeply meaningful my art could be with that message. So to loop back around to your question: Despite my introverted self, I would not be an artist if it weren’t for the inspiration and support of others. Friends, loved ones, and strangers have all impacted both my art and myself in wonderful ways—and I can hardly wait to see who or what inspires me next! What has been the response from other librarians, especially to your Libraries Are for Everyone signs? The response almost overwhelms me when I think of it. 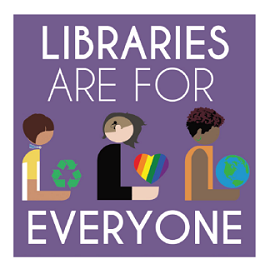 I have received the most heartfelt emails from library workers around the world who have shared what those Libraries Are for Everyone signs have meant for themselves and their community. I’ve lost count of the times I’ve teared up at my desk from things shared with me on social media. It’s usually the ones from the U.S. that get me the most—where immigrants or refugees have shared their joy at seeing themselves represented through imagery or language. I’ve printed out several of those posts and have them at my work desk. How have you seen the current era of political divisiveness play out at Gretna Public Library? Gretna is a very interesting place. It’s the fastest growing city in Nebraska for several years now, which has caused a bit of division. There is a core group of proud “Old Gretna” residents who are more on the very conservative and non-diverse side of things. The new residents have been bringing in a greater diversity, and we’ve seen that reflected in our library patrons. So there was already a division in our community. Reflecting on this question, I can’t say that I’ve seen a different level of divisiveness. Years before our current president, we had an elderly woman incredibly upset that we had a book of illustrated Quran stories on display in our junior nonfiction section. One of my team members did an excellent job of explaining that it was on display as a new title in our library—like everything else on top of the nonfiction section. That calmed the woman down, and she thanked us for the explanation. And we had a large display featuring my Libraries Are for Everyone signs at our Children’s Library. It really wasn’t commented on, and my director and I had been prepared to get complaints. The most consistent issue is over at our Main Library (where we have our Young Adult and Adult collections), and perceived “liberal” books get turned around if they’re on display. Or if it’s a book on an uncomfortable subject in the Young Adult section, we’ll find them hidden behind other books. In terms of displays, we have very limited space; therefore, we try and make our displays as diverse as possible so that it gives the message that these things aren’t outliers or shouldn’t be a part of a display on x, y, or z. How does Gretna Public Library promote diverse books? Like I mentioned before, we want as many skin colors, beliefs, abilities, etc., as possible to be a part of any of our displays. We are also very thoughtful in our collection management. I manage the children’s books and graphic novels for all ages. Thankfully, I have help on the Young Adult area. But I keep an eye out for diverse books and order them when it makes sense for our collection. We also select books for our book clubs that many of our patrons might not have picked for themselves. The most memorable was when our Adult Summer Reading book club did Ta-Nehisi Coates’ Between the World and Me. It was the lowest-attended discussion we’ve had for our book club, but I think that the two ladies who attended really took something away from both the book and the lack of response from the other members. Just considering my response to your questions, I’m realizing that we could do more. What keeps you hopeful about the state of the world today? There isn’t a lot out there that has me hopeful. I’m a recovering pessimist, so my gut reaction is doom, doom, DOOOOOM!!!! But I do have glimmers of hope, and a lot of it has to do with the fact that there are still good people out there. There are people with empathy, people with creativity, people who enjoy learning, growing, and helping. And some people may view this as dark, but even if we mess things up to the point of extinction, the universe will go on and be beautiful, brutal, and amazing.